Swarovski Crystal Rose Gold is a rich and luxurious effect where half of the bead is a solid 18-Carat rose gold coating and the other half is a medium grey Black Diamond toned color.This on-trend Metallic look is an exquisite addition to the Swarovski line that is available in 5328 Xilion Bicone Beads, 5000 Round Beads, 5050 Oval Beads and the 5535 two hole Column Beads to name a few, as well as a variety of Swarovski Pendants, Flatback Rhinestones, Sew-on Stones, Round Stones and Fancy Stones. This unique two-toned color combination brings together the beauty of neutral crystal grey hue with the refinement of precious metal that creates a trendy, feminine look in which all that glitters is gold. 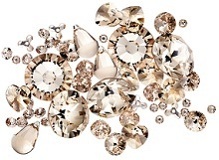 The new Swarovski color Light Silk is a very subtle light peachy-tan color, almost neutral tone that is soft and elegant. This timeless and versatile shade exhibits a quality of sophistication and blends very well with Light Peach and any light tan color such as Crystal Golden Shadow or Light Colorado Topaz. It would also pair nicely with the apricot tones of Crystal Brandy. This is a perfect accent color when used in small beads or pendants such as the 5328 Xilion 3mm, 4mm or 6mm Bicones, 5000-4mm Round beads, or 6010 11mm or 13mm Briolette Pendants. It can also be used as more of a focal point with the larger beads or pendants. It’s a perfect shade for graceful designs especially Swarovski wedding jewelry and will complement many creative expressions with its adaptable quality. The Swarovski Crystal Rose Gold Pearl exudes a timeless beauty with a rich and decadent creamy shade of gold enveloped in a protective pearlescent coating. This gorgeous gold tone pearl is lovely and sophisticated incorporating a chic vintage effect that is perfect for professional attire, evening wear and wedding jewelry alike and is available in a variety of Pearl styles. Mix and match different styles to create a unique look. 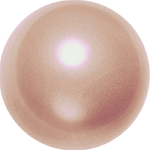 This pearl is presented in the traditional style 5810 Round Pearls, as well as the 5811 large hole Pearls, the 5816 Teardrop pearls, 5817 half-dome pearls, 5818 half drilled pearls, 5821 pearshape pearls, 5840 Baroque Pearls and the 5890 BeCharmed Pearls. This eternally elegant and silky gold tone radiates seductive feminine charm. The spectacular 4230 Lemon Fancy Stone is a fresh new interpretation of two classics. The classic 4227 Navette shape and the elegant facets of the 4584 Chessboard cut are merged into a streamlined convex lemon shape. It is ideal for creating floral patterns but also facilitates abstract modern designs. Available in three different sizes, it is the perfect element to create matching items of jewelry. The style 4773 Meteor Fancy Stone is brilliant asymmetrical crystal stone that compliments an edgy, rock and roll type of glamorous look. 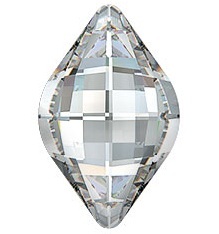 The Swarovski Fancy Stones can be set or glued into precast jewelry and with its unique cut and brilliant depth, the extraordinarily eye-catching stone exudes and astral elegance and opulent beauty. The Swarovski 5026 Round Cabochette Bead is an innovative style with two different qualities seamlessly blended together, it simply has it all. It blends the aesthetic appeal of precision-cut facets with the simple sophistication of a deliberately smooth surface, offering an entirely unique appearance depending on the angle. The romantic feel of this bead is harmonized through the marriage of two diverse surfaces coming together to create a stunning textural expression of a stylish new look, one that is inspired by a natural glistening water droplet. 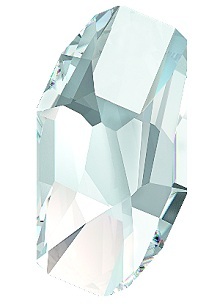 This exclusive Swarovski product is a rare find and one that will allow for many unique jewelry combinations. The secret to beauty is often simplicity. The 50284 Crystal Globe Bead fascinates with its completely round shape which, in its perfection, bears the distinctive signature of SWAROVSKI ELEMENTS, accompanied by an opulent 3D effect. 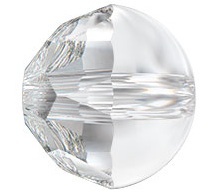 It is available in the 6mm, 8mm and 10mm and as a round element, the Crystal Globe Bead combines especially well with the new 5026 Cabochette Bead & 6026 Cabochette Pendant or the classic style 5000 Bead to create subtly stylish designs. 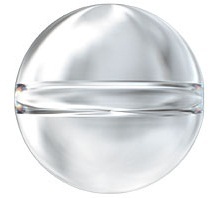 In its perfect simplicity, the Crystal Globe Bead is a masterful tribute to Swarovski’s precision and purity. Its roundness makes it an exceptional and extremely versatile carrier for any color or effect in a myriad of crystal jewelry designs. 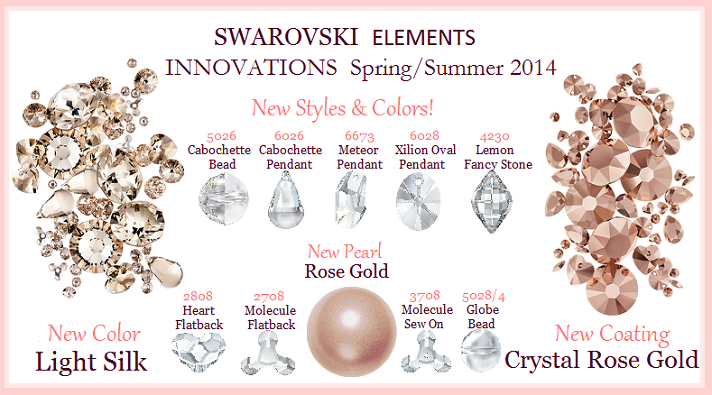 The BeCharmed Pavé beads, available in this form exclusively from SWAROVSKI ELEMENTS, are exceptionally brilliant. This large hole crystal bead is offered in a variety of beautiful shapes such as the 80101 BeCharmed Bead with clustered pave design using the radiant 1088 Xirius Chaton Round Stones, the 80201 BeCharmed Bead using 4428 Xilion Square Fancy Stones and the 80301BeCharmed Bead using the 4547 Baguette Fancy Stones. 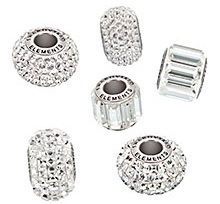 These stylish and versatile beads are comprised of a fashionable stainless steel inner core ring featuring the exclusive SWAROVSKI ELEMENTS logo. These high end elements are exceptionally beautiful and easy to use, perfect for making either single necklaces or bracelets by simply stringing it onto your favorite chain, or stack multiple colors together to create a unique jewelry set similar to the popular Pandora charm jewelry line. The larger hole offers options for utilizing coarser materials such as rubber, leather, or fabric can also be incorporated into the designs. Your options are truly endless with these elegant and fashionable beads. Click here for a dazzling array of color inspirations!